This is the first in a series of guest posts by my cousin and guest blogger, Amy Cheng. Welcome, Amy! A colorful addition to any tea party or meal with children in attendance. Nobody can say no to JELL-O! 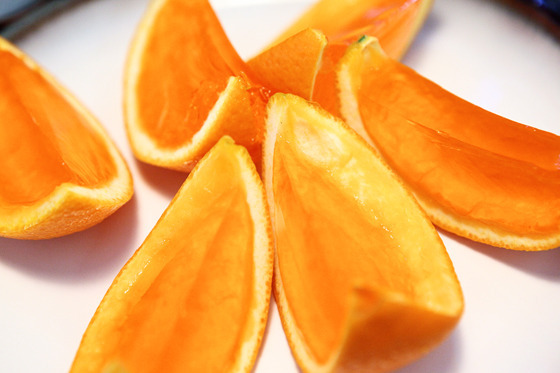 Cut oranges in half from top to bottom (not through their equators). Using your fingers and a small spoon, remove all the orange pulp, set aside for another use. Leave all the white pith and make sure no holes appear. Place the empty shells in muffin tins, for stability. Make 3-ounce package of flavored gelatin according to package directions, except use 1/4 cup less water. Fill the orange cups completely to the rim; refriegerate until set. To serve, remove orange cups from muffin tin. Slice each lengthwise into two or three crescents. I would love to try lemons, grapefruits, limes with different flavors for other fun color and flavor combinations. Can you imagine limes with watermelon JELL-O and sesame seeds for little watermelon slices? Adapted from Country Tea Parties by Maggie Stuckey, 1996.